08/28/11 - Apple Crisp My blog where the pictures mentioned in the write-up below are inline for viewing: http://maryanng.blogspot.com A month of so ago, I ordered the Pampered Chef Apple Peeler Corer from my friend Patricia who had a Pampered Chef party. I'd always wanted one having seen one demoed in person years ago at another party. Although not inexpensive by any means, I decided that this was the party/year to get it. As with many things, it takes me a bit to get the time to read about them and set them up. But with hurricane Irene giving us yucky weather, yesterday seemed like the day to sort it out. 8 screws to set up the platform wasn't too bad and then watching a video on YouTube gave me a good demo on top of the hand written instructions on just how to 'make it work'. I had two eager helpers ready to test the first apple. Success! Wow! Ooooh Aaaah! Here's a video of Johnny with the first apple: Video Link http://www.youtube.com/watch?v=ZgJxWhU-WtA And just to prove that boys and men of all ages love their gadgets: SmugMug Link http://fotomom.smugmug.com/Nature/August-2011/18330920_7pCmrW#1451262944_pn6ngvS SmugMug Link http://fotomom.smugmug.com/Nature/August-2011/18330920_7pCmrW#1451262954_v2w8BPZ Hard to say what was more fun. Turning the crank fast or watching the peel spaghetti get created or lifting the apple spirals and playing with them (clean hands of course). A few things to note. If you have a table that you can attach the apple peeler corer too, that may actually be better than buying the fancy base. As you can see in the video, Johnny had trouble holding the base still...trouble he would not have had on a table. Besides peeling and coring, this things slices too. The slices might be a tad thin for some pies, but worked just fine in my apple crisp. I did thoroughly wash and dry the apples first. Mushy apples don't work anywhere near as well. Hungry for apple pie? ;-) Irene update: Irene ended up going just far enough East of Raleigh to spare us too much trouble. I have lots of large chunks of leaves down in my yard and a few small limbs. When I walked Blaze, I started picking up. We lost power twice but just for a few minutes so no impact short of startling the kids. We did have a few gusts of wind that caused me to hold my breath, but nothing that had me white knuckled for any real amount of time. We've seen much worse and my heart goes out to those who were truly affected by the storm. What fun! Love apple crisp. Great collage. Looks like you guys found a good way to pass a rainy day. Nice collage of activities. Glad you weren't hit too hard by the storm, I wasn't hit too hard here in maryland either... we were lucky! I'm so glad to her that you're all safe and sound. 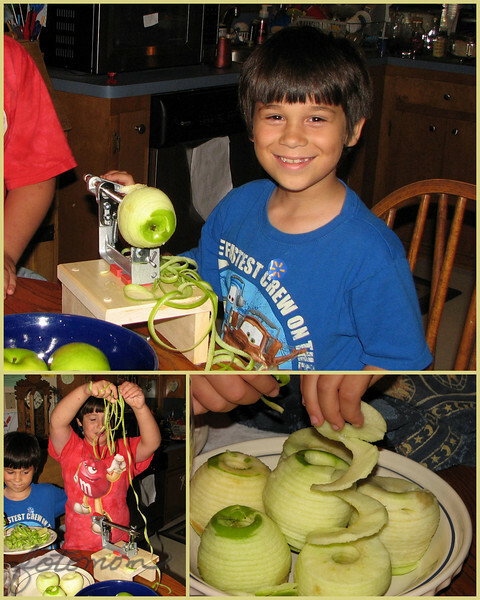 The apple peeling looks like so much fun (love those curly Cues). It looked like a fall culinary event that's for sure and it's just around the corner. looks like a cool tool mom ! Looks like some great fun !! Oh that looks very cool, awesome collage and what a great thing to do during a storm! The boys look like they are having a great time. Glad you had little damage as well. How fun!!!!!! Glad that you made it through the storm. Kids are great aren't they?